Attention golfers! Would you like to play a round of golf without pain, return for a round of golf after injury or surgery, or even just hit the ball farther and more consistently? 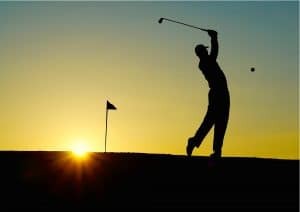 The Golf Rehabilitation and Performance Program can help improve your game and address any physical limitations that may be impacting your ability to effectively swing the golf club. It has become increasingly vital in the golf industry for golfers to surround themselves with a medical team of experts to maximize their full potential. The Titleist Performance Institute (TPI) has dedicated years of research on how the body functions in relation to the golf swing. The TPI team, consisting of over 50 medical experts, has created a 16-part evidence-based physical screen to identify any physical limitations. This screening and assessment identify physical limitations, biomechanics, movement quality and physical fitness with the goal of maximizing physical capabilities to make the most efficient swing possible. In addition to the TPI screen, a video analysis of golf swing and subjective history is used to create a customized plan. The Golf Rehabilitation and Performance program at ApexNetwork Physical Therapy in Troy consists of an initial evaluation 16-part TPI physical screen to identify any physical impairments, video analysis of the golf swing, and a customized golf exercise program to address limitations and impairments. A TPI Medical Certification gives medical professionals the ability to assess golf-specific injuries and establish rehabilitation techniques to improve player performance and reduce injury/pain. Cory Henry is TPI certified, and in addition to his expertise of the human body as a physical therapist, he can apply and establish a well-detailed golf program to address your goals and deficits. Whether you are an aspiring professional golfer, amateur, old or young, the Golf Rehabilitation and Performance Program can benefit your golf game. If you would like to improve your golf game contact Cory at the Troy, Illinois clinic and schedule a visit or inquire about prices and packages.